With so much talk about big data and the possibilities it can offer, the truth behind what big data is—and what it can do for businesses—can be hard to determine. However, according to Dr. Barry Devlin of 9sight Consulting, the truth behind all the talk is not hard to see, provided that organizations are willing to return to the principles of good data management processes. 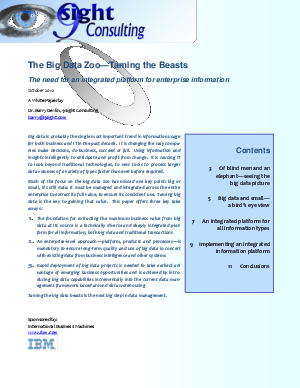 According to Dr. Devlin’s white paper “The Big Data Zoo—Taming the Beasts”, data is still data, whether big or small. It needs to be managed effectively if organizations want to be gain value from it. Although big data may present special challenges for IT organizations, the principles of data management haven’t changed.